With the Pointer tool, select the artwork you want to convert. The Convert to Symbol dialog box opens. Type a name for the symbol in the Name text box. Select the symbol type: Graphic, Animation, or Button. To scale the symbol without distorting it, select the Enable 9-Slice Scaling Guides check box. To store the symbol so that it can be used in multiple documents, select the Save to Common Library check box. Click OK to close the Convert to Symbol dialog box. Then click Save to save the symbol in the Custom Symbols folder. You can now find the saved symbol by choosing Window→Common Library. Double-click the Custom Symbols folder to locate any symbols created and saved to the Common Library. 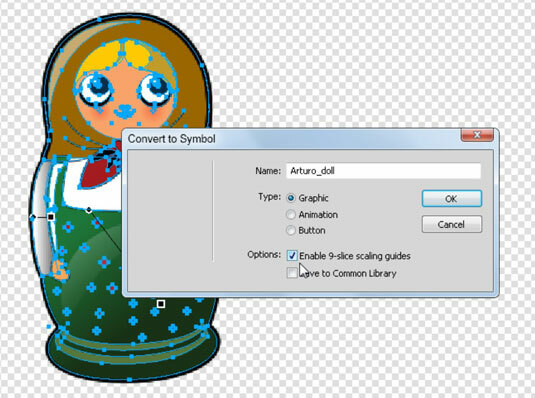 Adobe Illustrator has many symbols you can borrow from its symbol libraries. Simply drag a symbol from the Illustrator Symbols panel onto the artboard and then copy and paste the symbol into Fireworks. All components, such as vector shapes, are maintained.